Ripple announced today that Coinone Transfer, a subsidiary of major South Korean cryptocurrency exchange Coinone, will be using xCurrent, Ripple’s flagship product for bank-to-bank cross-border payments. The Fintech Company, Ripple seems to put a lot of effort into spreading its use cases towards traditional banking institutions, especially in the Asia Pacific region. After partnering with 61 Japanese banks for an around-the-clock cash transfer app, the news comes from South Korea this time. As advertised by Ripple’s official Twitter account on May 8th, 2018, a new partnership just took shape with Coinone Transfer. The tweet links to a company press release that provides further details about the so-called partnership. Coinone Transfer is the subsidiary of cryptocurrency trading platform Coinone that specializes in remittance and settlements. This makes Coinone Transfer the newest member of Ripple’s partners’ pool that already counts prestigious banks such as Santander, Japan Bank Consortium, Siam Commercial Bank, and AKBANK. The partnership announcement took place just two weeks after South Korea’s cryptocurrency trading platform giant expanded into Southeast Asia’s vibrant hub of Indonesia. The new Indonesian branch is officially set to start in June 2018, and will likely boost Coinone’s growing notoriety and active users base. Coinone currently handles around $82 Million of daily transaction volume, allowing its users to buy from eleven different cryptocurrencies (including BTC, XRP, ETH, QTUM, and IOTA) using a the fiat currency: the South Korean Won (KRW). Ripple, the San Francisco based fintech giant, is among the rare cryptocurrency centered businesses to bridge traditional finances to the capabilities of Blockchain. xCurrent, an instant cross-border settlement service with end-to-end tracking. xRapid, digital-currency enabled source liquidity for emerging markets. xVia, an API-based seamless standard payment interface. While xCurrent is already full-engines running and actively penetrating the inter-banking finances, both xRapid and xVia are solely available for early access. 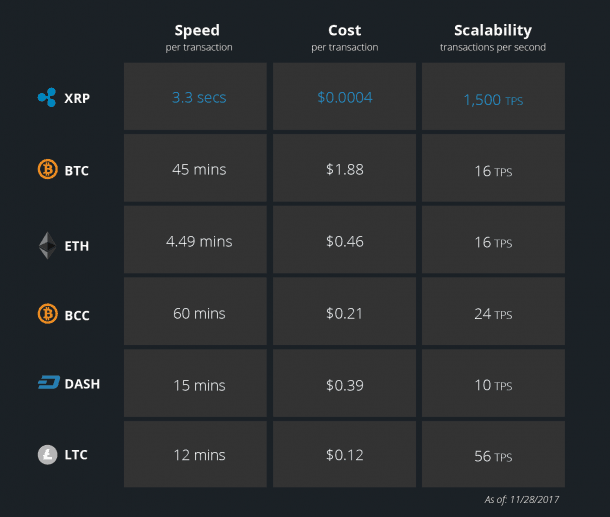 RippleNet praises itself for having the lowest transaction fees among other major Blockchain based cryptocurrencies, such as Bitcoin (BTC), Ether (ETH), Bitcoin Cash (BCC), Litecoin (LTC) and Dash (DSH). They do this while offering the most substantial scalability of 1500 transactions per second, and impressive network speed of 3.3 secs per transaction. This image outlines how RippleNet compares to other major Blockchain based cryptocurrencies. As of today, Ripple (XRP) trades at $ 0.8, where it seems to have established a resistance level. The cryptocurrency was ranked 6th by trading volume yesterday. XRP realized 2.67% of the total 24-hour crypto-trading volume ($21.9 billion). 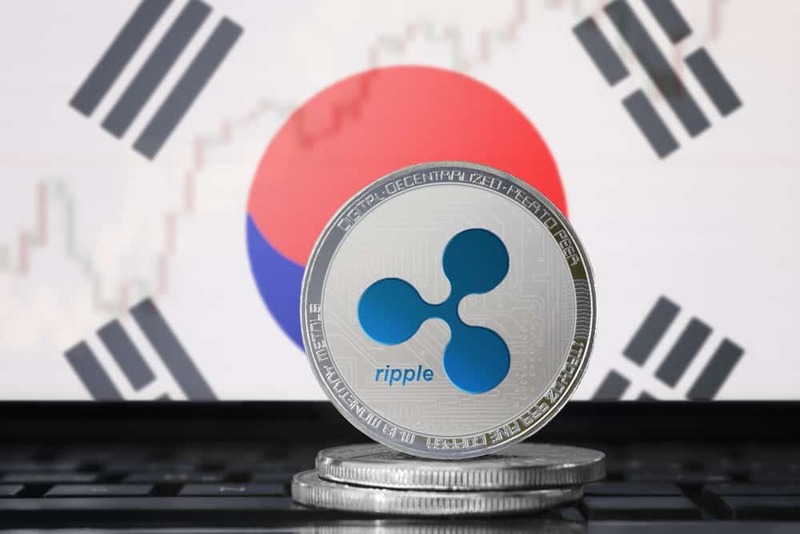 Ripple (XRP) is most prevalent in the Asia Pacific, with the majority of the trading volume occurring in South Korea’s Bithumb and Upbit, and Japan’s BitBank.